This is a ProLiant 6000 Pentium II Xeon 450-512K Processor Option Kit which will allow to upgrade your server to a dual-processing machine thus increasing productivity and the overall performance. 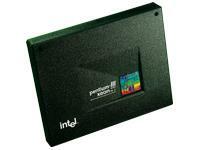 The Xeon's distinguishing attribute is its L2 cache memory which is incorporated into the processor cartridge. This cache memory runs at full processor clock speed, which means that the processor has to waste very few clock cycles idle, waiting for the memory to 'catch up' and feed it more data. The L2 cache also supports ECC (Error Correction Code), which allows the memory to detect and correct single-bit data errors on the fly, protecting the integrity of your important data so that it does not become corrupted during normal use. The Xeon can also support large amounts of L2 cache memory; different versions of the Xeon will incorporate 512KB, 1MB, or even 2MB of L2 cache. The Xeon has inherited MMX technology multimedia enhancements from the Pentium II, and like the faster Pentium II's, the Xeon runs on a 100MHz system bus, allowing it faster access to main system memory. Also like the Pentium II, Xeon processors require a special retention mechanism to secure them to the motherboard, preventing shock or vibration damage.